Looks: Kino has black hair and white skin, his eyes hold the legendary Doujutsu, rinnegan, yet a little different from what it seems, it has an orange pupil in the middle as where the original rinnegan has only purple. Kino stands at 4'2 feet tall in the air straight and taill with out a hunch. He weighs at 132 pounds. His hair is usually spiked up and his head band holds his hair up. Personality: Kino usually feels as if no one likes him, he usually doesn't talk to anyone as they usually made fun of his eyes. Some feared his eyes, so they would shun Kino which leads to why he doesn't talk much. He doesn't normally care if anyone likes him or not, he continues training for no reason what so ever, he had no dreams. He personally hates everything and everyone, only few people he actually liked and they died. Eventually Kino stopped befriending people as they died almost every time. He is almost always working harder however, training trying to become the best for no reason, he had nothing else to do. Clan History: The Uchiha clan descended from the elder of the two sons of the Sage of the Six Paths. The elder brother inherited the Sage's "eyes", powerful chakra and spiritual abilities. When it came time for the Sage to choose a successor, he questioned the two on what course of action they would follow to bring order to the world. The elder believed that power was the way to bring peace, while the younger believed love was the way. The Sage favoured the ideal of the younger brother, and therefore designated the younger as his successor, causing the elder to be filled with jealousy and hate. From this hate came what Tobi calls the Curse of Hatred (憎しみの呪い, Nikushimi no Noroi). From the younger son descended the Senju clan who would be the eternal rivals of the Uchiha. Before the founding of the ninja villages, the Uchiha were one of the many mercenary clans for hire. Because of their Sharingan, the Uchiha clan came to be known as one of the two strongest clans, the other being the Senju clan. Madara Uchiha was particularly powerful, and, upon attaining the Mangekyō Sharingan, he took control of the clan. Under his leadership the Uchiha grew stronger, conquering whatever clans they came upon, such that, whenever the Uchiha clan was hired for a job, the opposing side would hire the Senju, and vice versa. The Senju clan, grew tired of the endless fighting, and approached the Uchiha clan with a peace treaty. Madara feared that an alliance would lead the Uchiha to ruin, but his clan disagreed, and he was forced to accept. The two clans came together to form Konoha, with Hashirama Senju, leader of the Senju Clan, being selected as Hokage. Madara believed that this was proof that the Uchiha would be made subservient to the Senju, but his clan saw this only as his attempt to rekindle the flames of war. They turned their backs on him, and he defected. Following Madara's betrayal, the Second Hokage gave the Uchiha control of the Konoha Military Police Force as a sign of trust. According to Tobi, this was really just a way of keeping the Uchiha in check and out of Konoha's governing affairs. Over the years, some Uchiha, such as Setsuna, have figured out this motive's true meaning, and tried to rebel against the village as Madara did, but they found that it was too late to make a difference, as the Senju had already completely suppressed the Uchiha. The Uchiha clan after the founding of Konoha, preparing a coup d'état against Konoha. Years later, after the Nine-Tails' Attack on Konoha, Konoha began to suspect that an Uchiha was behind the attack. Tobi claimed that the Uchiha were relocated to a corner of the village so that they could be more easily monitored. The Uchiha interpreted this as confirmation of what Madara had warned them of years earlier, and began to plan overthrowing the village. One Uchiha, Itachi, disagreed with the coup d'état, and informed Konoha's leadership of what the Uchiha were up to. The Third Hokage, Hiruzen Sarutobi, tried to negotiate for a more peaceful approach. This failed, and to prevent an uprising that would create another war, Itachi was ordered to wipe out the Uchiha. The end of the Uchiha clan. Itachi spared only one Uchiha: his younger brother, Sasuke. Sasuke would spend the next few years trying to avenge their family by killing Itachi, something Itachi had planned for from the very beginning. Once accomplishing this goal, Sasuke learned of Tobi's existence. Tobi told Sasuke about the Uchiha's history and why Itachi had wiped out the Uchiha, prompting Sasuke, with Tobi's help, to resolve to destroy Konoha. Itachi, a member of the clan using the Great Fireball Technique. The Uchiha were famous for their powerful chakra, exceptionally strong techniques, and natural aptitude for anything combat-related. The clan possessed a proficiency in fire techniques, having created several and using them more skilfully than any other. Their signature technique was the Fire Release: Great Fireball Technique. Clan members were not recognised as adults by the rest of the clan until they could successfully use this technique. The Uchiha were also highly known for their mastery of ninja tools. They themselves invented many shuriken move sets which required the use of thin metal wires, one example being the Windmill Triple Blades technique. The Uchiha clan were most feared for their powerful Sharingan, a kekkei genkai which gives them the ability to see the "colours" of chakra, allowing them to analyse and copy their opponent's skills, along with a number of other abilities. Only a select few members of the Uchiha clan manifested the Sharingan. Due to their natural affinity for battle, and their proficiency with eye genjutsu, many ninjas considered it more tactically favourable to flee rather than face an Uchiha shinobi in one-on-one combat. Among the techniques granted by the Sharingan, the Izanagi is deemed to be forbidden, due to it rendering the user blind in exchange for temporarily manipulating reality and fantasy within the user's own personal space, such as turning injuries and even death inflicted upon the user into mere illusions. Though the clan was feared for their Sharingan, the eyes have also been transplanted into various characters outside the clan. Madara and Izuna, the first Uchiha to awaken the Mangekyō Sharingan. Madara Uchiha was the first to develop an advanced form of the Sharingan, the Mangekyō Sharingan, which can be activated by the pain of losing close friends or family members. However, frequent use of the Mangekyō Sharingan deteriorates the user's eyesight and results in blindness. Only by taking the eyes of a sibling can one's vision be restored, a process that results in the creation of an Eternal Mangekyō Sharingan (永遠の万華鏡写輪眼, Eien no Mangekyō Sharingan). Itachi indicated that the intricacies of the Mangekyō Sharingan were only discovered after years of trial and error, implying that many Uchiha throughout history had made the attempt to gain the Mangekyō Sharingan. One member of the clan, Madara, had managed to awaken the Rinnegan, shortly before his death. As it has been hinted that this was a natural evolution of the Eternal Mangekyō Sharingan, there remains the potential for others in possession of the latter to awaken the ability too. However, the exact requirements involved in this process have yet to be disclosed. 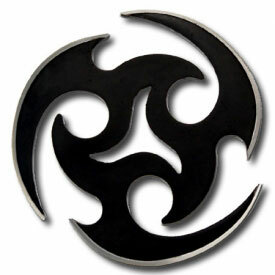 Description: The user unleashes a volley of shuriken with one hand, while at the same time exhaling fire-infused chakra onto them in order to increase the weapons' destructive potential by making them capable of inflicting severe burns upon direct contact with either the intended victim or any other object caught within their trajectories. Description: This path's "chakra absorption" ability was primarily defensive, since it was capable of absorbing any ninjutsu-related technique, thereby nullifying its effect. This technique could also take the form of a barrier around its body, allowing it to absorb attacks from all directions. In addition to its defensive properties, this body's ability had also shown offensive capabilities, as it could absorb all the chakra out of any person that it touched or grabbed. It was incapacitated and petrified during the invasion of Pain after it absorbed too much of Naruto Uzumaki's senjutsu chakra and turned into a toad statue. History: Kino was born in the land of the forest. He was born unique, with a special ability which know one knew of. It was rumered to be the legendary rinnegan, yet it was different from it. Kino was like no other before, his eyes made him quite unique. His parents, unsure of their child almost considered killing Kino due to his eyes. His mother, was an Uchiha, His father a Senju. Kino was born outside of the village when his parents were on a vacation, they kept their child out their so that no one would see his eyes. Eventually Kino made his own appearance in the village of course he was arrested due to no one knowing him. After awhile his parents would convince the village to let him out, they soon entered him in the ninja academy afterwards. While in the academy, he heard talk about his eyes often, he was left out of many activity in the academy. He was mostly picked on because of his eyes, he had felt no one had liked him, he felt hated unwanted, he felt as if they wanted to kill him. This had led to the activation of the sharingan, yet he and his parents didn't know, the rinnegan was blocking it. He had nothing to do so he usually was always training, he trained evenly in every area, his strength matched his speed perfectly. He trained in the academy jutsu so he was already a master. During the academy years he found few ability that came with his eyes that no one else had known about. He could completely absorb fire, and also absorb chakra, and he could summon the dead. He had mastered these ability sooner or later, he mastered them three days before graduation exams. During the graduations exam he had passed with flying colors and ranked up, yet he hadn't much care.